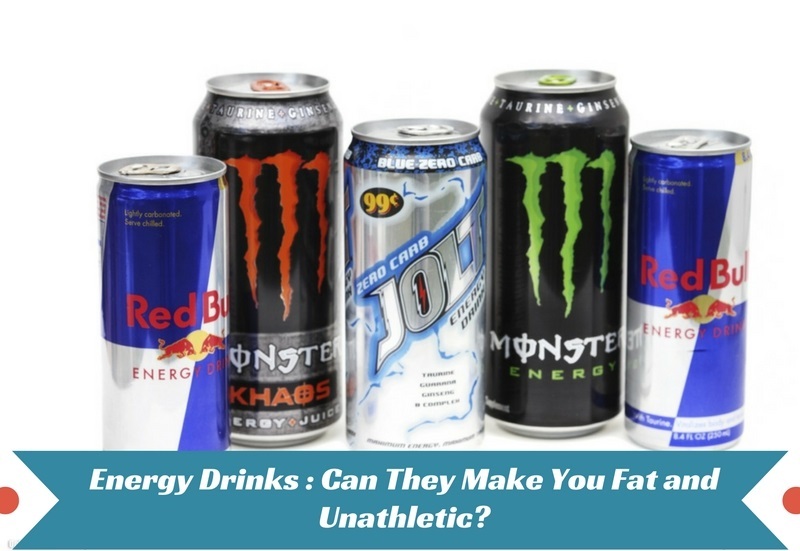 Energy Drinks : Can They Make You Fat and Unathletic? You are here: Home / Diet & Fitness / Energy Drinks : Can They Make You Fat and Unathletic? 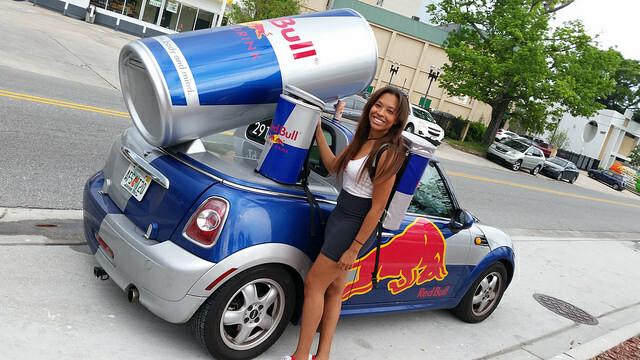 Red Bull can give you more than wings if the latest scientific studies are taken into account..it can also boost weight gain! Energy drinks are used for one of two purposes– for lowering fatigue or for improving sports performance. Drinks such as Monster have been marketed as weight loss beverages. But studies suggest that calorie-rich energy drinks can actually cause you to pile on the pounds. Energy drinks are high in calories and sugar content. Gaining weight is associated with the number of calories coming in and being used. The simple math behind the weight gain from such drinks is that if you eat more calories than you burn, you can gain weight. While eating the right number of calories for losing weight or maintaining the optimal weight for your height and build, consuming energy drinks thinking them to be the perfect weight loss formula can actually backfire. Energy drinks lead your body to gain surplus calories, spurring weight gain. Energy drinks contain a huge number of calories. A majority of this comes from sugar. A branded 24-ounce energy drink contains over 420 calories. while a smaller can of 16 ounces were around 220. Energy drinks even lack the power to satiate you. 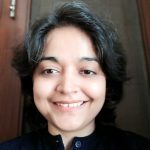 So you are consuming empty calories without feeling full and trying to overcome hunger pangs by overeating–hardly the picture energy drink companies want to paint. But it is based on facts, not marketing. According to the Academy of Nutrition and Dietetics, energy or sports drinks are only needed when working hard for more than one hour. 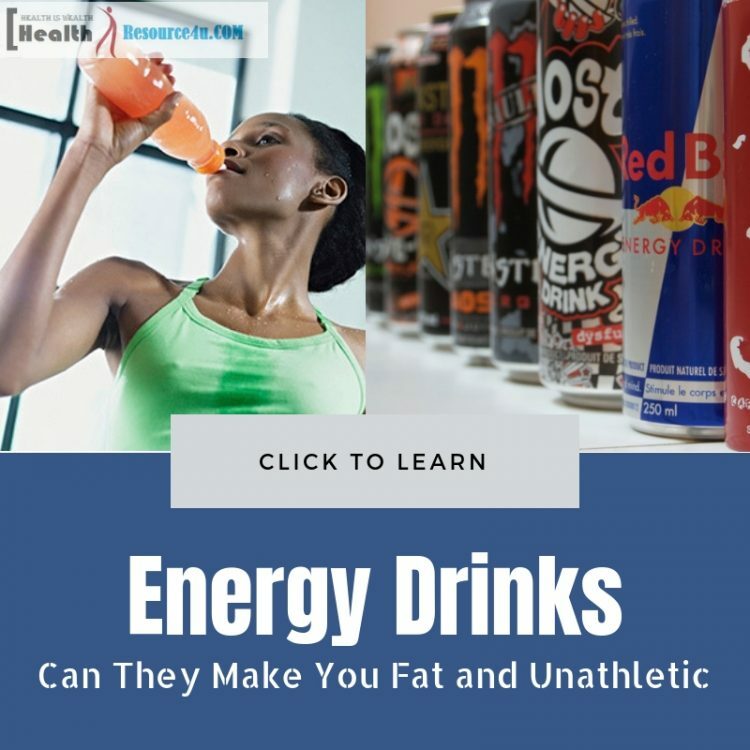 Though Sports Dietitians of Australia hold that athletes can improve glycogen count and aid performance, the fact also is that high caffeine content in these drinks is lethal when it comes to hyperactivity. 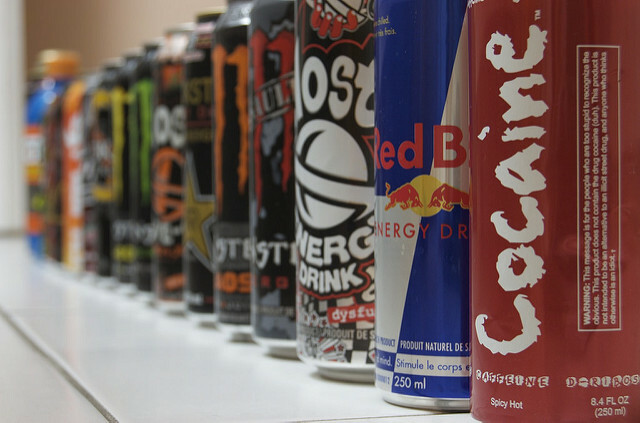 Drinking too many energy drinks can even lead to medical complications and death, reports the Huffington Post. Sports beverages are even more dangerous if you do not workout. To boost energy, drinking them as against working out in a gym can be disastrous. A normal 32-ounce can of energy drinks contains close to 50 gms of sugar. This is roughly the same as a can of soft drink. Moreover, the sugar won’t quench your thirst– the fructose actually exacerbates it. All that sugar goes into your oral cavities or forms additional layers of fat on your body and only backfires if the goal is weight loss. Many brands of energy drinks do not have protein in them. This is essential for the development of muscle tissue. Protein is the building block of the body and it repairs tiny micro muscle tears after a heavy workout. Athletes require more protein, not less. Given that energy drinks mostly lack protein, the advantage of these recreational drugs is nil. Many commercial energy drinks are fortified with synthetic vitamins. This makes them a poor alternative to natural vitamins. Why is this so? Quite simply because synthetic derivatives aren’t easily separated or used by the body. Absorbing natural vitamins is easy. The same cannot be said for the synthetic versions. A peer-reviewed study in General Dentistry found that energy drinks cause irreversible damage to the enamel of the teeth. Energy drinks also provide a short-lived energy boost but that’s about it. If you’re looking to create a calorific deficit, be aware that energy drinks add calories to your body. To lose one pound of weight, you need to burn 3,500 calories per day or 500 calories over a week. Many energy drinks claim to boost the metabolism and promote loss of weight. One study conducted by the University of Oklahoma points to this as a possible way to help with the process. But even this study concluded that decrease in body fat was at 0.09 percent while the decrease in fat mass was lower than 0.05 percent. Many energy drinks are packed with sugar adding around 100 calories per serving. Drinking one actually translates into 10 pounds weight gain in a year. For all your health enthusiasts and weight watchers out there, another red flag is that energy drink buzz can make you feel you are losing calories,without actually doing so. Columbia Health has reported that caffeine from energy drinks may cause a loss of fewer than 100 calories in a day. If the aim is to burn 3500 calories or one pound of fat, it will take you more than a month to achieve this. Branded energy drinks even contain more than 116 calories per 8-ounce can, on an average. What About Sugar-free Energy Drinks? Sugar-free energy drinks, according to an estimate by fitness site Livestrong, holds less than 12 calories per 8-ounce cans. Does this mean you get to lose weight after all? The answer to that is also a resounding no. Recreational energy drinks lead to weight gain because your body responds to artificial sweeteners. This results in the release of natural sugar-processing hormone which affects appetite and blood sugar management in the long run. Yes, that can of energy drink could also lead to diabetes, according to experts. Energy drinks have 80-100mg of caffeine in every 8-ounce serving. If you see the normal caffeine intake allowed for an adult (200-300mg), drinking two to three cans of Red Bull or Monster is hardly advisable. Those prone to migraines may even get a headache as a result of drinking these energy drinks. Studies have found that those with eating disorders tend to consume more energy drinks. A 2011 study reported in International Journal for Eating Disorders even found those with eating disorders such as anorexia turn to recreational energy beverages to increase energy levels and suppress the appetite. Medical repercussions of abuse of energy drinks include everything from anxiety and tremors to withdrawal headaches. What about sugar-free energy beverages? Well, they aren’t any safer. Artificial sweeteners found in zero sugar or sugar-free drinks can cause abdominal pain, diarrhea, and water retention as well as seizures and electrolyte imbalances. Most energy drinks are made of simple carbonated water with fattening high fructose corn syrups and added sugars. Along with this lethal mix is a high dose of caffeine, amino acid taurine and artificially derived vitamins. So, energy drinks leave you feeling thirsty and unsatiated. They add calories to your body. They don’t improve athletic performance in people who are not stimulated by caffeine in a certain way and may even prove addictive. They lack natural vitamins and proteins needed for the body to recover and perform at your optimal best in athletic games. Any more questions about whether such energy drinks are beneficial for you are merely empty rhetoric!